Ofelia D. Ruelas obituary. Carnes Funeral Home. Jun 17, 2012 The Carnes Funeral Home Staff offers our sincerest condolences to the entire Ruelas family. It was our honor to serve your family. 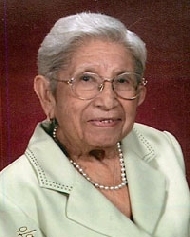 Surrounded by family, Ofelia D. Ruelas, passed to a better life with our Lord, on May 8, 2012. Ofelia was born January 1, 1922, in McAllen, Texas, to the Rev.Elias Delgado and Guadalupe Garcia Delgado. Her parents precede her in death, as well as her husband, Carlos Ruelas, son, Carlos S. Ruelas Jr., brother, Jose and his wife Irma Delgado, brother, Caleb Delgado and sister, Emma Lozano. Ofelia, or Lita, as she was fondly called, was a loving mother, grandmother, great grandmother, sister, and friend to many. She is survived by sister in law, Maria Delgado, brother in law, Paul Lozano, sister, Ruth, and husband, Eduardo Colejio, sisters, Loida Cortez, Minerva Ramirez, Omega, and husband Mario Hernandez, Eunice and husband Ramiro Rodriguez, and brother Elias (Jr.) and wife, Norma Delgado, daughter, Norma and husband Genero (Tony) Ybarra, daughter in law, Eriko Ruelas, sons, Albert Ruelas, and Sheldon Ruelas. She had eight grandchildren, ten great-grandchildren, and numerous, nieces and nephews. Lita was a stay at home mom with a big heart. Through the years, she babysat many children, who also became part of our family. She devoted her time to her family and church and had been an active member of WMU and UFM, where she enjoyed being a helping hand and working on Church Mission Projects. The family will have a Memorial Service on Saturday, May 19, 2012 at First Baptist Church 1400 9th Avenue North, Texas City, Texas. Viewing and visitation will be at 5:30pm and Memorial Service 6:00pm. The family would like to thank all our friends and the members of First Baptist Church for their prayers and well wishes, during her time of illness.